SVAN 958A Class 1 Four-channel Sound & Vibration Analyser is dedicated for all applications that require simultaneous class 1 sound and vibration assessment. 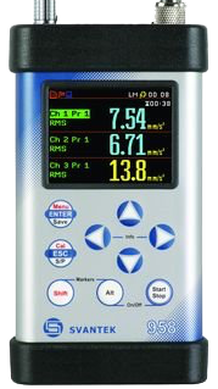 Each of four input channels can be independently configured for sound or vibration detection with different filters and RMS detector time constants giving users an enormous measurement flexibility. The real advantage of SVAN 958A is the capability to perform advanced analysis simultaneously to the level meter mode. In practise this allows the user to obtain broad-band results such as Leq, RMS, LMax, LMin, LPeak together with four-channel analysis like FFT or octave band analysis. 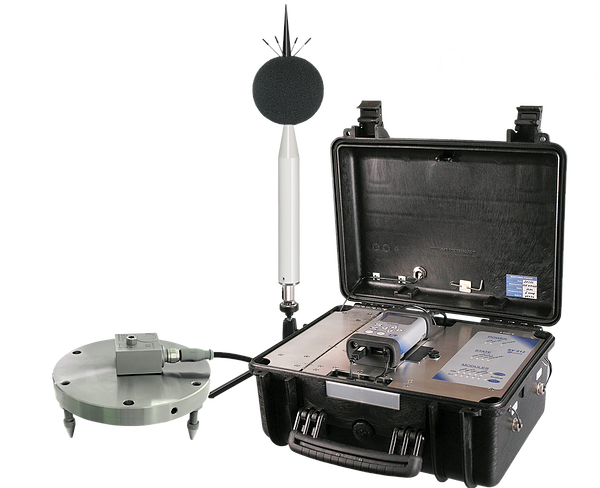 List of available analyser functions includes FFT, 1/1 or 1/3 octave, cross spectra, sound intensity, RT 60 and more. The 4-channel time-domain signal recording to .wav format is available as well as an exceptional feature! All measurement results are stored in non-volatile 32 MB internal memory or USB memory stick and can be easily downloaded to a PC with SvanPC++ software. SVAN 958A with RS 232 interface (SV 55) can be offered with GPRS modem or LAN & WLAN connection module. Together with SvanPC++_RC remote communication software, these interfaces provide easy remote access to instrument settings & data over Internet and local area network. Instrument is powered from four AA standard or rechargeable batteries as well as from the external DC power source or USB interface. Robust case and light weight design accomplish the exceptional features of this new generation instrument.